This might hurt my Halloween credibility but until I put this list together I had no idea that there are 11 Halloween movies. Yes, this film that was spawned by the great John Carpenter in the 1970s has, like its antagonist Michael Myers, lived on. To think that we are still making these films 40 years out is not only triumph of low budget filmmaking, but it's very a testament to the staying power of the horror film genre. Now, just because we're still making these films doesn't mean that they're any good. In the case of the canon of Halloween films, mainly certainly aren't. What they are, above all else, is interesting and in the age of the reboot before the film is even released (okay, I am exaggerating) that is certainly saying something. Which leads us to this new, 2018 version that wipes the slate clean. It picks up where the original Halloween from 1978 left off and says to hell with the other films. Sure, there's a wink here and there (I'm sure you Halloween-philes caught the Silver Shamrock masks that were so prominent in Halloween III: Season of the Witch when some kids were trick 'r treating), but ultimately this new Halloween is little more than the 1978 version in 2018 (more on that later). To its credit, the Halloween films are all pretty solid. Yes, a few of the films in the actual canon leave a bit to be desired, but overall the first 4 films are easily digestible. Okay, I realize that that is less than 50% which is an F under any other circumstances, but as far as genre movies go that's pretty darn good. With a worldwide gross of close to a half a billion dollars, you're going to get some clunkers amidst all of those sequels and reboots. The reality of the Halloween films is that they are cultural icons. The films themselves have their detractors and ardent defenders. I am have no doubt that this list is going to be both loved and derided. Such is the the horrific nature of both lists and the films we do them about. John Carpenter's Halloween is literally the perfect horror film. It mixes suspense, action, bloodshed, and everything else that makes horror movies the special experiences that they are. Honestly, to not make this film the first film on any list that ranks all the Halloween films would be truly wrong. Jamie Lee Curtis as Laurie Strode leads this cast and she's aided to great effect by Donald Pleasence as Dr. Loomis. However, Tony Moran as Michael Myers is the real scene stealer. This character is so iconic, so well defined, that we all feel like we know Michael even though he never says a word. With a plot about a killer returning home to kill again, Halloween is a deceptively simple horror movie. It is rich with characters, lore, and truly terrifying moments.This is the standard bearer for all slasher films. Period. When it was first released Halloween III: Season of the Witch was both confounding and infuriating. Many people who loved the first two Halloween movies, in which Michael Myers stalked humans like a shark at the beach, balked at the idea of a Halloween film that didn't feature everybody's favorite slasher. This film would be a succes d'estime that was still centered around Halloween. Only this time the killer wouldn't be some supernatural entity, rather, it would be the masks that make this holiday so special. When 80s horror movie stalwart Tom Atkins discovers this plot, the whole affair makes us wonder if it isn't too late to stop it. Featuring an awesome soundtrack by John Carpenter, a really interesting story (even if it isn't Halloween-centric), Halloween III: Season of the Witch was a bold tale of macabre that has finally gotten its due. Random film tidbit time... Martin Scorsese's original title for his breakout film Mean Streets was titled "Season of the Witch". Of all the horror movie sequels I have ever seen, Halloween II might be the best one. John Carpenter elected not to do the sequel and instead handed over the reigns to Rick Rosenthal (Bad Boys). And what a movie Rosenthal made! Picking up right where the first one left off, Halloween II never misses a beat. Michael Myers as again after Laurie Strode, trying his best to finish up the job he started in the first film. Set in a hospital, this contained kill-fest would bewww.mmdst.come the model for how many horror (and lower budget) films are made to this day. With an ending that is just about as perfect as perfect gets in cinema, Halloween II doesn't get enough play in regards to the fantastic feat that it acwww.mmdst.complished. Oddly, this film didn't do that well upon it's initial release. The first Halloween offering from Rob Zombie was a little too mired in the realm of The Devil's Rejects. Yes, we all know that when he took on the lore of Michael Myers that Zombie would be bring his spin to things. It went a little overboard there and ultimately created a film that was a caricature of itself. More on that later, however. This 2009 version of Halloween II is nothing short of a beautiful failure. Think of it is as Francis Ford Coppola delivering Rumble Fish after his triumph with The Outsiders. Only Rob Zombie didn't have The Outsiders on his hip before he made Halloween II. This film had vision, nuance, and a wholly different take on Michael Myers. So much so that, like the 2018 version of Halloween, it would humanize him by showing Myers doing mundane things like walking down the street. 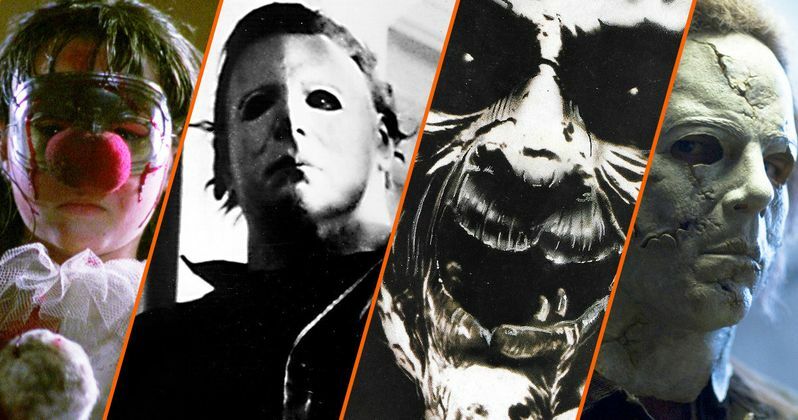 There was a whole imagistic idea happening with a white horse, what it symbolized, and a host of other cool oddities that make Rob Zombie's Halloween II worthy of a "canon-leap" over some of the original films. Many people saw Halloween 4: The Return of Michael Myers as a return to form after the "failure" of Halloween III: Season of the Witch six years prior. And what a return it was as Michael was back to his old tricks as he terrified the town of Haddonfield once again. This time, Laurie Strode wasn't the object of his fascination. Rather Michael was going after his niece Jamie (Danielle Harris). This idea was both interesting, creepy, and it resonated enough with fans for there to be a Halloween 5: The Revenge of Michael Myers one year later. Once Donald Pleasence triumphantly returns as Dr. Loomis. Also, Danielle Harris was perfectly cast as the actress to inherit the role that Jamie Lee Curtis so elegantly defined. Sadly, after this film, the Halloween franchise really started to grow long in the tooth. However, it's nice that we have 4 really solid films to bank on before that happened. Spearheaded by Jamie Lee Curtis, this 7th installment finds Laurie Strode all grown up and working at a boarding school. She has a son (Josh Hartnett) and Strode's pretended to be dead all these years so that Michael Myers would never find her again. Well, good luck with that as Michael returns and is intent on finally getting his girl. Conceived as a sequel to the first two films in the series Halloween H20: 20 Years Later was another fairly solid offering in the Halloween canon. It was reinvigorated, it had Dimension Films behind it, and on a $17 million budget it brought in over $75 million domestically if you factor in the home video receipts. Honestly, when Laurie does Michael in at the end the of the movie, it certainly seems like the franchise has finally hit its end. Fear not Halloween lovers as there would be one more canon film (though it hurts me to call Halloween: Resurrection that), and three more Halloween films made after this one.